B78311-6032L-WH is rated 5.0 out of 5 by 1. Rated 5 out of 5 by dlong6839 from An Excellent Product at a Reasonable Price I wanted to replace the bath tub with this unit due to mobility issues. The low threshold makes it easy to step in and out of. The footprint is that of a standard tub, so the changeover was relatively easy. 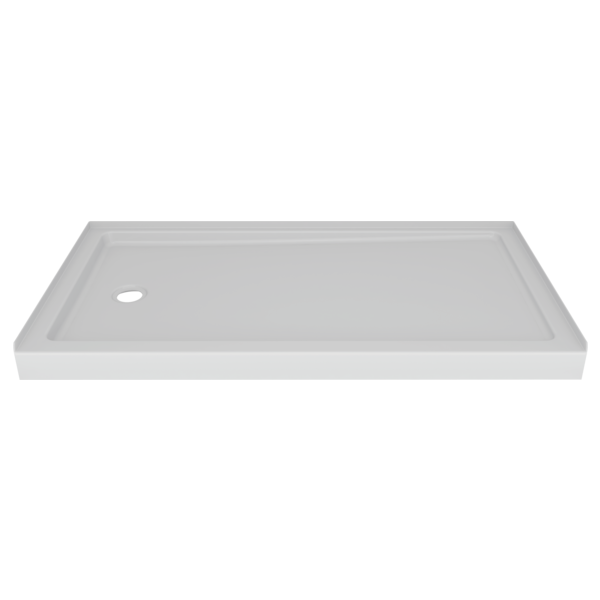 The floor is very solid with no give, and the tongue-and groove assembly between the base and walls virtually eliminate the possibility of leaks. It was well worth the investment. The floor where I want to install my shower base is perfectly flat so that the base touches the entire subfloor, however it is 1/4&quot; out of level. Do I need to put in a mortar base to make up the quarter inch? And if so, does the mortar base need to be under the entire base and also if so, what is the minimum thickness? In other words, can I make the mortar bed thin where it is level and then build up to the quarter inch, or is there a minimum thickness that needs to go down and then make up the quarter inch? or does this base require a shower door? Can the threshold be drilled into to install a glass shower door? The middle layer has a slight gap from the top layer around the drain. Do I need to seal between these or when I tighten the drain does it seal the two layers? If the floor is level what is the recommended adhesive to use for install of the base? Can this be installed with tile walls or only matching wall set?